Landscape transformations in the rapidly urbanising landscape are the most dynamic process affecting the local ecology and environment. The urbanised landscape do provide to its inhabitants the complex social and economic environment leading to further increase in population. Consequences of the unplanned urbanisation are enhanced pollution levels, lack of adequate infrastructure and basic amenities. This necessitates understanding of spatial patterns of the growth for an effective urban planning. This communication analyses the landscape dynamics of Belgaum City with 5 km buffer using Shannon entropy and explores landscape patterns through spatial metrics applied to the temporal land use data. Remote sensing data acquired at regular intervals through satellite borne sensors enables the synoptic monitoring of urban growth patterns and dynamics. Spatial metrics enables the quantification of urban footprint. Assessment of spatial and temporal dynamics of the landscape and quantification of patterns through metrics helps in the understanding of urbanisation process. This communication focuses on the monitoring of land use and land cover dynamics of Belgaum City with a buffer of 5 km. Land cover analysis is done through the slope based vegetation indices show a decline of vegetation from 98.8% (1989) to 91.74% (in 2012). Temporal land use analysis reveal that the increase of urban pockets (built up and other paved surfaces) from 0.31% (in 1989) to 6.74% (2012), the tree cover has decreased from 4.62% (in 1989) to 2.44% (in 2006). Direction wise gradient analysis through spatial metrics and the Shannon entropy highlight an increase of fragmented growth during post 2000 in all directions. Belgaum,Land Use,Land Cover,Urbanisation,Urban Sprawl,Landscape Metrics,Remote Sensing,Geoinformatics. IEEE 802.11 WLAN uses Binary Exponential Backoff (BEB) algorithm to reduce the collision probability. Due to the lack of significant differentiation between light/medium and heavy traffic, BEB applies the same contention window adjustment strategy. As a consequence, several technical issues such as high collision probability, unfair medium access and throughput degradation may occur. To mitigate these anomalies, this paper proposes an adaptive algorithm, named as Linear Increment in Contention Window Control (LICWC), with different contention window adjustments based on the current network status. The NS2 simulation results exhibit the enhanced performance of the proposed method under saturated and unsaturated condition for Linear and Random topology of wireless network, incorporating mobility of nodes. Growth of mobile devices usage has been exponential in the last couple of years. There are a number of software applications that are being developed every day and are ready to be downloaded for mobile devices. There are many business applications such as mobile banking, trading, alerts etc., which require a great deal of testing before they are released to production. There have been many challenges to deliver new applications following the software development lifecycle SDLC i.e. development, integration, review, testing, and release in the shortest possible time with lowest cost. Not limiting to new development alone, the upgrades of these applications also pose challenges in test management. Time has become the biggest constraint due to the continuous upgrade of hardware and emergence of mobile basic software. In this paper, we explore the challenges faced by testing organizations/teams in testing mobile applications apart from Orthogonal Array testing and its advantages in improving testing productivity, limitations through a case study on testing a financial application on mobile devices. IEEE 802.11,Combinatorial Testing,Pair-wise Testing,Orthogonal Array Testing,User Acceptance Testing,Mobile Applications,Testing Effectiveness. Requirement Elicitation process is to organize the analysis phase of a software development methodology in a more thematic way, and from the perspective of communication, by examining the critical dimensions in ensuring effective communication in requirements elicitation and in a way that is particularly pertinent to the requirements engineering literature. The requirements development processes, therefore, vary widely depending on the people involved. The insufficient requirements engineering process forms one important factor that cause the failure of a software project. 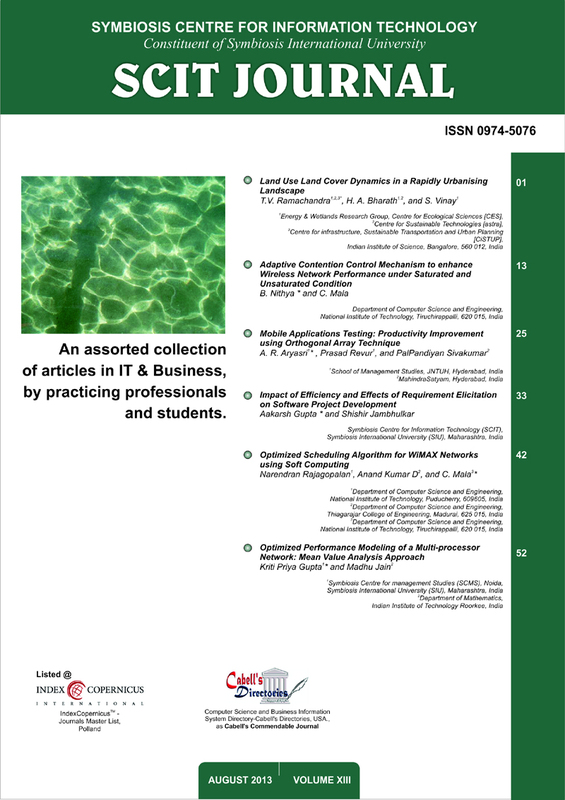 The paper explains the essence of requirement elicitation and its various techniques through which requirements are collected. A comparison of some of the various techniques of requirement elicitation practiced today has also been done to emphasize that a single technique is inefficient to meet all the requirements. The problems and findings existing in requirement gathering process through requirement elicitation has been explained and using a research methodology analysis of various requirement elicitation techniques and their trend in the IT industry is emphasized. WiMAX is a wireless communication standard designed for Wireless Metropolitan Area Networks to provide up to 75 megabits-per-second data rate. An optimized scheduling algorithm is proposed in this paper using soft computing techniques such as genetic algorithm and fuzzy inference system. A cost function depending on parameters Queue length, downlink rate, uplink rate, priority and blocking probability is formulated and used. The results show that Genetic Algorithm provides near optimal scheduling in comparatively less time and hence can be used in real-time scheduling in WiMAX networks. Fuzzy Inference System uses the parameters as inputs to Mamdani and Sugeno models and computes the optimal scheduling to various nodes. In this paper, we analyze the performance of Computer Communication Networks (CCNs) by using queueing network model. The problem of optimizing the performance measures of the CCNs is discussed. We determine the optimal service rates such that the throughput of the system can be maximized. The performance modelling of a multiprocessor CCN is also discussed using Mean Value Analysis (MVA) which is a numerical technique. MVA is widely used for analyzing CCNs and gives mean values for the performance indices of CCNs. The analytical model for the multiprocessor CCN is described using queueing networks. An algorithm for computing various performance measures viz. throughput, mean response time and mean number of jobs in the system using MVA is presented. The performance measures are also established by using neuro-fuzzy approach which is one of the important soft computing approaches. Numerical illustrations for comparing the MVA results with the neuro-fuzzy results are provided. The numerical illustrations show that the results obtained through neuro fuzzy approach are at par with the results of MVA. Computer Communication Networks,Mean Value Analysis,Multi-processor,Performance Modelling.